You do need the browser, while youtube-dl & VLC are mutually exclusive (means either one of them can do the job). Below is the brief description of the steps needed to achieve the goal of twitch video download. Now we’re going to look into each method a bit deeper. With illustrations where required. Also, please, keep in mind: this guide works for any type of twitch video, whether you’re trying to download a live stream, video on demand or some short clip (though clips don’t have m3u8 and can be downloaded directly as mp4 video file). First method involved an outside third-party tool called youtube-dl. You can download it here http://rg3.github.io/youtube-dl/download.html – just look for windows exe version. After file is downloaded, it’s good to put it somewhere in %SYSTEMPATH% folders, or at least remember where it gets saved. Usually it’s the default downloads folder for the browser, or desktop – two most common locations for downloaded files. Find video on twitch, click on it. Then we need to copy the Video LInk, for that either hit Share button on the video and click Copy, or click on the browser address bar, then press CTRL+A to select all text, and CTRL+C to copy it into clipboard. Now with the link copied, press CTRL+ESC, then type CMD and press ENTER. this will open black screen with blinking cursor, waiting for commands to be submitted. Well, at this point if your files are downloaded into standard folder, you need to type CD downloads and submit with ENTER. if it’s desktop – “CD desktop” & ENTER. this will place you in the same folder with youtube-dl program. Only this time don’t copy any video links, instead we’re going to use DevTools (a.k.a. Browser Inspect Tab). These “tools” come as part of pretty much any desktop browser, so no extra downloads or installations are required. You can open this tab by pressing CTRL+SHIFT+I (in chrome) or Right-Click on the page and select INSPECT. Now the harder part starts. We need to find and copy video m3u8 link. It’s not the actual video page link, but rather browser playlist link, where playlist isn’t a number of songs put together, but rather number of chunks of some video stream. Browser downloads these chunks 1 by 1 and plays them for you, and you don’t see any interruptions between chunks or anything.. It’s just easier for browsers to do little 5-10 second pieces of video rather than download whole 10hrs at once..
There’s so much in there, we need to filter by our desired type m3u8, so the screenshot below shows where to type in m3u8, and how the list looks now – very clean, only 3 entries. If this list is empty, it means you opened this tab after page load, – simply F5 refresh the page. 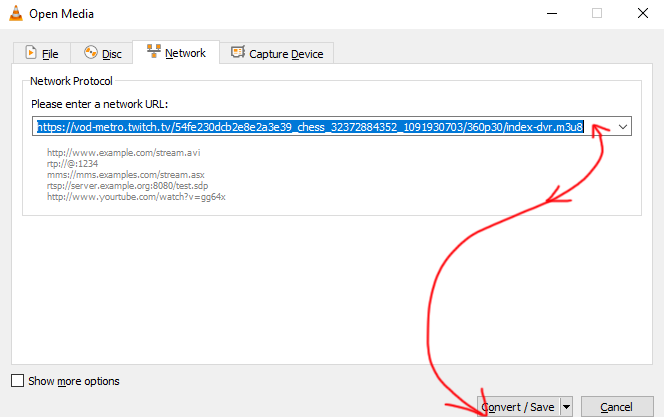 How does playlist work, it first sends global m3u8 that lists all the streams, and then browser or you pick one of those streams, so player reads the corresponding m3u8 file. 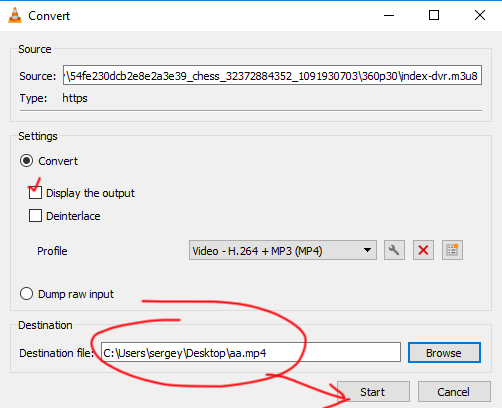 Open VLC media player, in the menu select Media and Convert / Save, or press CTRL+R. In the window that follows Paste the link we copied to clipboard earlier in the box (press CTRL+V or Right-Click + Paste). 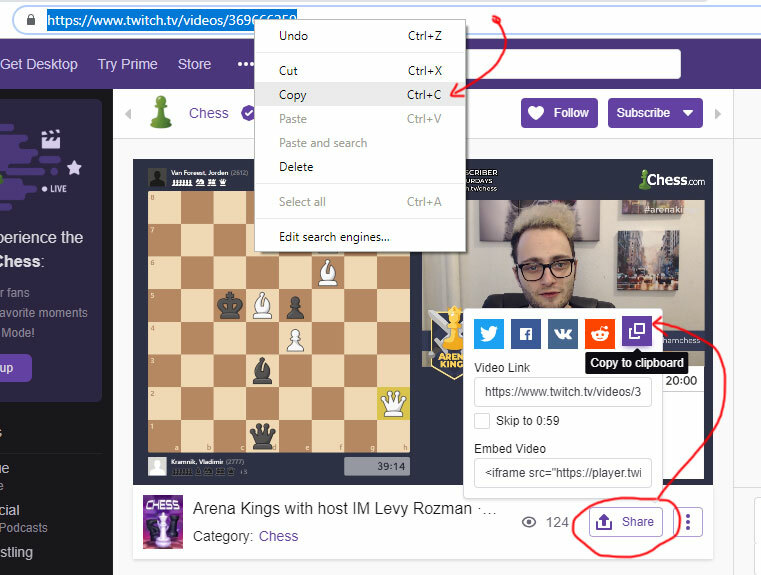 My link reads looks something like this https://vod-metro.twitch.tv/ 54fe230dcb2e8e2a3e39_chess_ 32372884352_109193 0703/360p30/index-dvr.m3u8 (I intentionally added spaces to break this link, it will expire in a few hours anyway, I think), this is only for educational purposes, so you could compare how your link looks like, it’ll be similar to this one.. Here’s how it looks like..
Click Convert/Save, next screen click Browse and in the standard file dialog enter filename you’d like to use for this video (no extension). I entered aa. You can select here whether you want VLC to convert video to some special format (Profile), or Dump Raw input. When ready hit START to begin download and conversion. Here’s how the actual process looks like. Below you can see multiple indications of work going on that I’ve highlighted. Interesting, you can also watch the video (this may greatly slow down the actual download and conversion, if player will refuse to read faster than you watch), or watch some other video in the same player, – conversion and download won’t stop until finished or interrupted. 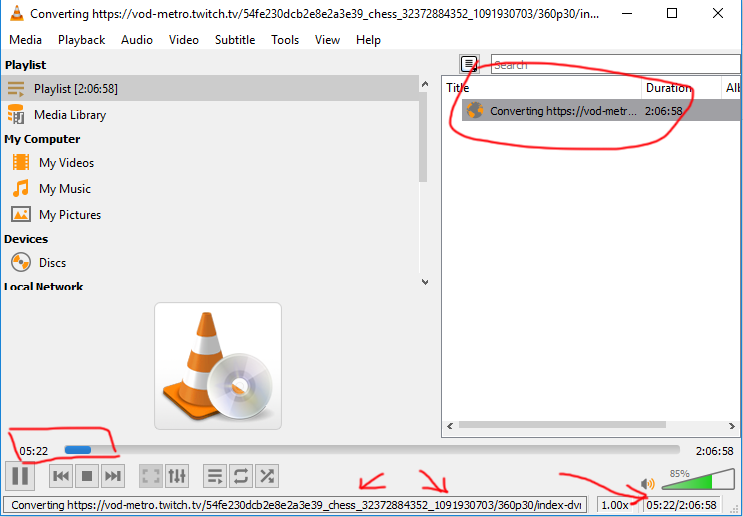 It is quite easy to download twitch videos and live streams on your workstation, using either youtube-dl (command line youtube downloader) or VLC media player. Just need a tiny bit of technical knowledge, which I have undoubtedly delivered in this article. Enjoy! Hope this info helps many people, I do know there’s ZERO online twitch video downloaders, they all say they can do stuff, but none of them actually do.. Hopefully soon someone can make a working one… Until then, enjoy this nice facebook video downloader. peace! !